A healthy and balanced diet can safeguard us from a lot of health problems. There is no problem inmunching those yummy fries and fast foods once in a while; but if you are addicted to them, then you are actually inviting a lot of trouble for yourself. Immense work pressure often leads us to ignore our diet and we end up in eating a lot of snacks, fast foods, fries, as well as ready to eat food. After reaching home, finishing the whole day’s ordeals, we are least enthusiastic about preparing food and prefer indulging in the junk foods. But have you ever pondered about an appliance which will take care of preparing a delicious, awesome, and warm meal while you are away. Well, here comes the role of a slow cooker that can prepare a food on your behalf while you are working in your office and welcome you home with its luscious tang when you are back. A slow cooker is the magical kitchen appliance that can prepare a meal for you easily and the best part is that you need not spend hours in front of the oven. Just cut the fresh vegetable, meat, or any other ingredient that you want to cook inside it and set the timer. The appliance will prepare the food on its own and once it is ready to eat, the appliance will involuntarily switch over to the simmer mode to keep the dish warm. Once home, you will be lured to the kitchen by the delicious aroma. With slow cooker, you would no longer regard cooking as an ordeal but would rather enjoy cooking. A warm, healthy, freshly cooked and nutritious meal will be waiting for you at home each and every day. Oily foods are considered as an absolute no no by the doctors. Though it might taste delicious and melt in your mouth, its after effects are really harmful. Fried foods contain a lot of fat which is very difficult to burn out. Even if you are cooking food in the oven, you would definitely use a lot of cheese and butter to make it tastier. But slow cooker allows you to prepare dishes with the least amount of oil. So slow cooker is a much better, healthier option in comparison to other methods of preparing food. The method of preparing food using Slow Cooker is much scientific as well. Nutritionists are of the opinion that in the process of frying, boiling, or preparing food by any other traditional methods, a lot of nutritional values of the fish, meat, or vegetable are lost. However, the method of preparing food using slow cooker is very scientific and the least amount of nutritional value will be lost during preparation. 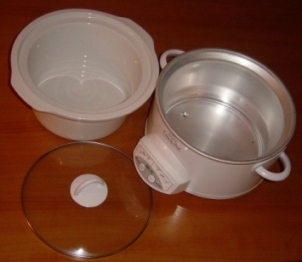 Vapor is primarily used for preparing food in a slow cooker; the food remains covered with a lid and minimal amount of heat is applied; these things work in favor of retaining the dietetic value of the food and making it a healthier choice. Thus a slow cooker is the ideal appliance with the help of which you will strike a perfect equilibrium between your work and personal life by indulging a balanced and healthy diet. Nutritious food is a basic requirement for leading an active and healthy life. So investing on a slow cooker will be a great choice for you and your family. The above article is written by Roxy Peters who specializes in writing articles related to homes and family.